On Saturday 3 February, tens of thousands of people took to the streets of London to protest against the on-going campaign to destroy the service, with similar demonstrations held in cities and towns across the country. Called by The People’s Assembly and Health Campaigns together, with unions and protest action groups advertising and organising transport from across the country, the demonstration also received a boost from being published in the Mirror. The demonstration came in the wake of a deepening crisis in the health service, with severe bed shortages over winter. Doctors, nurses, other healthcare professionals, and concerned citizens were also calling for further funding and better pay and conditions for staff, which have steadily been eroded over the past few decades, albeit now at a more noticeable and devastating rate (see ‘NHS crisis bites deeper. Workers taste the bitter fruit of capitalist market “reforms”‘, Proletarian, February 2018). “NHS manager numbers have risen by a quarter in five years and are higher than before the implementation of reforms designed to cut bureaucracy. “The increase in administrative staff far outstrips that for doctors and nurses over the same period, provoking anger from health unions. “More than 6,000 managers have been hired since April 2013 when controversial reforms by Andrew Lansley, then health secretary, came into effect, abolishing more than 150 NHS organisations and making thousands redundant. “Jeremy Hunt, the health secretary, has defended the reforms on the ground that they had saved money by cutting bureaucracy. Yet analysis of NHS Digital figures by the Health Service Journal finds that manager numbers have grown almost without interruption since the reforms took effect. “The 26,051 full-time equivalent managers and senior managers in April 2013 grew to 32,133 in October last year. This exceeds the 31,041 recorded on the eve of the reforms in March 2013. “John O’Connell, chief executive of the Taxpayers’ Alliance, said: ‘Not only are the NHS recruiting more senior managers, but they’ve also increased salaries at a faster rate than that of nurses…’” (Chris Smyth, ‘Hiring of NHS managers soars by a quarter in only five years’, The Times, 17 February 2018). We must recognise that the slow death of the NHS had been planned and managed by the ruling class for decades. Detailed in reports such as The Health of Nations published by the Adam Smith Institute and Britain’s Biggest Enterprise: Ideas for Radical Reform of the NHS by two conservative MPs, John Redwood and Oliver Letwin, the deliberate running-down of the NHS continues in order to sell the public on the successive reforms which pave the way for complete privatisation (see Dr Bob Gill, The connection between the junior doctors’ contract and the American corporate takeover of the NHS, 18 Nov 2015). 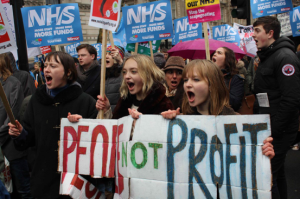 Many campaigns that have sprung up to defend the NHS, while welcome, have a tendency to be too narrow in scope and to allow themselves to be misled by politicians’ promises. Only by clearly understanding our rulers’ determination to dismantle the NHS for the benefit of private profiteers and by coordinating our efforts to save it can we hope to succeed. 8. the nationalisation of all drug and medical technology companies. It has long been the case that while public debt is social, profitable enterprises are in ‘private’ hands.